i Click 'view all' to instantly compare this ok deal with offers on other top fossil watches for men. 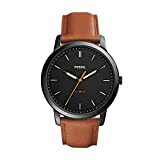 Fossil Men's FS4552 Machine Black Stainless Steel Chronograph is currently selling at $108.99, approximately $7.81 higher than average, giving a potential saving of $0.01 right now. With a lowest price of $95.99 and an average of $101.18 it is selling on the high end of its usual range. Price volatility is 17.68% (meaning it changes all the time), so the price will most likely drop in the next few hours. Right now this product is a recommended 'ok deal'. 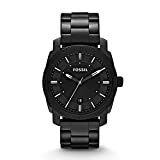 Compare the current price, savings (in dollars & percent) and Buy Ratings for the top Fossil Watches For Men that are closely related to Fossil Men's FS4552 Machine Black Stainless Steel Chronograph. 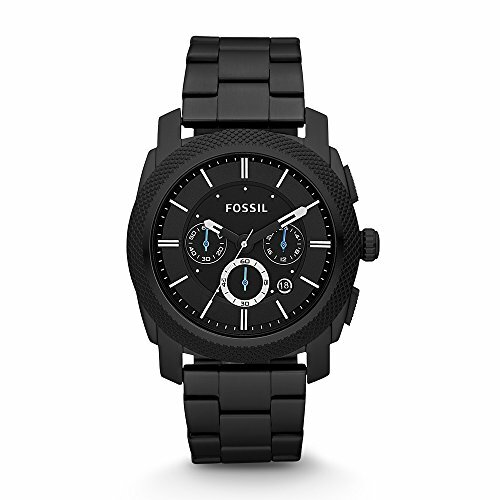 Here is how Fossil Men's FS4552 Machine Black Stainless Steel Chronograph compares with other leading Fossil Watches for Men. This monochromatic watch is the perfect neutral to transition from work to weekend. In brushed black, ion-plated stainless steel and matching dark dial, the classic timepiece features a textured bezel atop a 45mm case. From timeless classics to the latest fashions, Fossil is sure to have the timepiece that perfectly compliments your unique sense of style. Founded in 1984 when timepieces were created more for function than fashion, Fossil began to transform this notion with its unique combination of vintage 1950s Americana design and affordably accessible cool style. Adding to their collectability were the one-of-a-kind, trademark tins that came with the watches that mixed a creative spirit with a sense of humor. These iconic boxes are nearly as popular as the watches they hold and are regularly collected and traded throughout the world at flea markets, antique shops, and on eBay.